Senegal welcomed 163 Haitian university students to Dakar Wednesday. Senegalese president Abdoulaye Wade, offered them free education after an earthquake devastated their island nation in January. Sanogier Genevieve Julbertha arrived in Senegal Wednesday, less than a year after a catastrophic earthquake in her country killed about 200,000 people and caused widespread structural damage. The 20-year-old law student is one of the more than 160 Haitians who will enroll in a Senegalese university this fall free of charge. She says she does not have the words to describe how good it is to be in Senegal. She says we are the same people. We share the same roots. She says life is still difficult for many Haitians. Many universities collapsed, she says, and many families are still homeless. The Senegalese government was swift to offer aid to Haiti in the earthquake's aftermath this January, committing $1 million in emergency relief as well as offering land to Haitians who wanted to relocate to Senegal. Senegalese President Abdoulaye Wade addressed the students Wednesday at a ceremony at the foot of his recently-inaugurated Monument to the African Renaissance. He called the students' arrival an act of "panafrican solidarity." Mr. Wade says today marks the return of young Haitians to the land of their ancestors and a resounding victory for Africa. Others before us have tried, he says, only to return to a land still dominated by outside forces, but these students are returning freely to an independent Africa in control of its destiny. The students will attend one of three Senegalese universities on full scholarships from the Senegalese government. Mardoche Fontilus, 20, says he will study psychology in Senegal. The opportunity is a "dream come true," he says, but it cannot erase the memories of this past year. He says the earthquake impacted the lives of everyone in Haiti, and it was our brothers, sisters, aunts and cousins under the rubble. He says he is grateful for the international aid they have received, but January 12 was a sad day they will never be able to forget. Fontilus said he hopes the education he receives in Senegal will allow him to return to Haiti and help rebuild his country. Wanafiki na wezi wa fadhila waliogoma kufikiri wanasema elimu ya bure haiwezekani wakati wao ni matunda ya elimu ya bure. 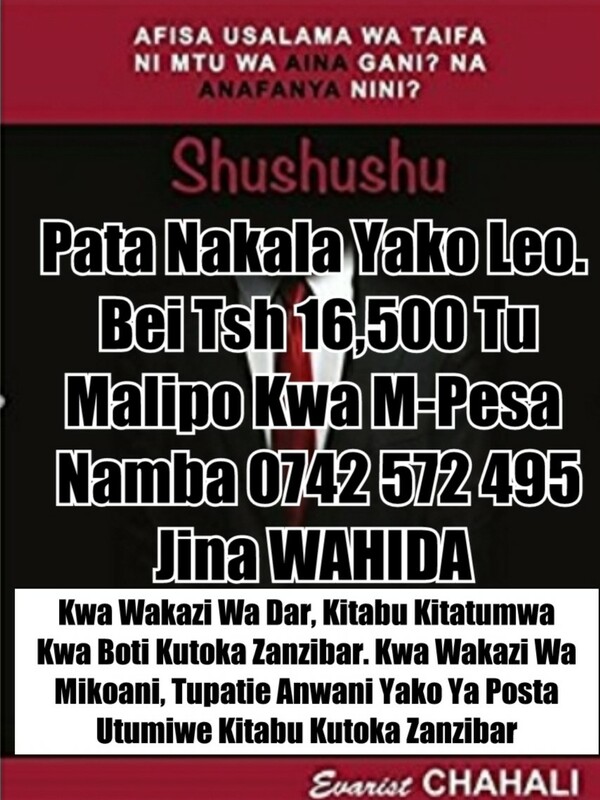 Wanasema ukweli kutokana na ukweli kuwa pesa ambayo wengetumia kutoa elimu ya bure wamewazawadia mafisadi kwa kuwapa mtaji wa kuingia ikulu. Ni ajabu watanzania kuamini kuwa elimu ya bure haiwezekani wakati ni jana jana tu tulikuwa tukisoma bure kabla ya mafisadi kuchukua nchi! Kwa mafisadi elimu ya bure haiwezekani. Lakini kwa wazalendo na watu makini, elimu ya bure ni reality, Think about that. Kuna haja gani ya kuchagua watu waliojionyesha wazi kuwa wako madarakani kutetea ufisadi wakiendeshwa na mafisadi kama vibonzo? Kuna haja gani kuchagua watu wasioamini umma wala Mungu bali ushirikina na ramli? Think again this time a bit critically. Kuna haja gani kuchagua watu walioishiwa katika kila fani hadi wakategemea usanii, matusi, uongo na vitisho kama sera badala ya sera? Tell me wapiga kura.